Our nomination to Garden Clubs of Australia for the Ann Williams Clark Medallion to be awarded to Myles Roser was successful and we are justifiably proud for him to be a recipient in this prestigious award. 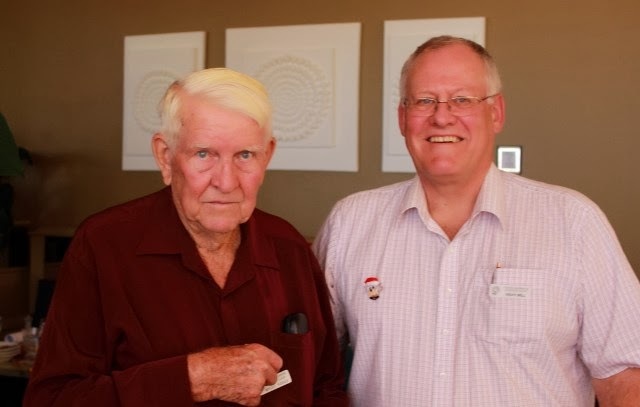 Myles was awarded theMedallion by Club President Geoff Bell at the Christmas function held at Opal Cove on 2 December 2013. Myles in his acceptance speech, said that Rhona Brooks, Coffs Garden Club President in the early 1990's noticed the Roser's beautiful garden and encouraged Myles and Pat to become members of the Club. This was the commencement of their journey with the CHGC. Myles also added that there have been many notable events and activities during his 20 year involvement and he has enjoyed all aspects of being a club member. It is testament to this attitude that the CHGC nominated such a worthy recipient for this award. He is an indispensable helper at each meeting, as he is one of the first to arrive and set up the meeting room organising the tables and chairs, setting up the library and the Trading Table, filling the urn and making sure the tables are set up for Afternoon Tea. He directs visitors to the Attendance Book and the Competition Table and welcomes them to the club. He has at times been responsible for the “Hint of the Month”, and presented the “Gardener’s Diary” for many years. Myles is an inspiration to our members for his dedication, his active participation in the life of the Club, his sense of humour and his ability to share knowledge and skills. When anyone has a practical gardening question Myles is the first person they ask. Through his activities at the Show he is continually promoting our Club in the Community and encourages gardeners to join our club. He was also the chief organiser of our fund raising BBQ’s each year, purchasing all the supplies and even peeling 20 Kilos of onions each time (!) and is an indefatigable worker at all the other events that the Garden Club participates in every year. He is also famous for his sandwiches, which he supplies on many of our outings and club events. When asked if the club wished to nominate anyone for this award, the members were unanimous in their support of Myles for his outstanding contribution to our Club and to our community.